The Cheshire Community Food Pantry (CCFP) provides food to Cheshire residents in need. In partnership with interdenominational organizations in Cheshire, the Pantry provides services which improve the quality of life of individuals and families. The Cheshire Community Food Pantry, Inc. is a tax-exempt 501(c)(3) organization and donations to it are tax-deductible. Donors receive an acknowledgement for their gift upon request. 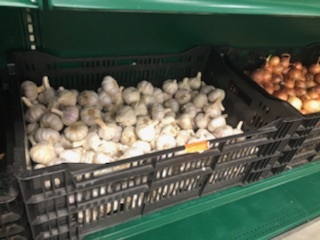 Cheshire Community Food Pantry is different from many food pantries because it uses a client-choice model in which clients are allowed the freedom to select their own groceries. This model provides food subsidies to low income families in crisis, while nurturing their ability to be independent and take control of their life. The first organized community food pantry in Cheshire was located at St. Bridget Church on Main Street. The tradition of caring for the less fortunate is nothing new at the church and began with the formation of the St. Bridget’s Guild in the fall 1934, primarily to care for the needy. The groundwork was set at the direction of Mrs. James H. Darcey, President and much was accomplished. 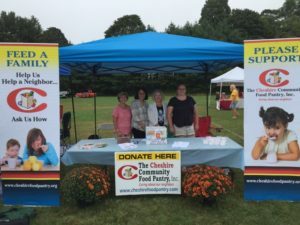 In 1985 it was determined that the establishment of a formal food pantry was necessary to serve our friends and neighbors living in Cheshire and the surrounding towns. 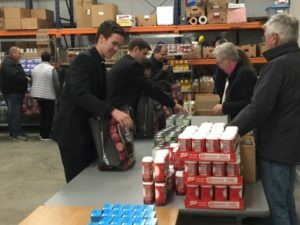 At the direction of Pastor James Gunnoud (retired) and the late Reverend Brian Monnerat, the pantry provided weekly food supplies to the needy. In 1985, Mary Alice Lee was appointed the first Director. She, along with other volunteers organized and set up a pantry in a locker room near the entrance of the St Bridget School. In 1995, with the re-opening of the school,and an increased need within in the Cheshire community, the pantry was moved to a 450 square foot, freestanding building near the southeast corner of the school parking lot. This building served as the pantry for the next fifteen years and as the local storage and distribution hub for food donated by Cheshire residents and business and civic organizations. Subsequently, parishioners Judy Proulx and Harriet Rybicki were appointed pantry directors. In the summer of 2009, Pastor Robert Ricciardi asked several people from within the parish and local community to serve on an advisory committee to assess the needs and logistics of the pantry operations. After studying the situation, the committee determined that, with a downturn in the economy and the resulting growing need for the pantry services, especially by senior citizens,, and with the physical limitations and location of the existing building at St. Bridget, an alternate location needed to be explored. Today we have a newly formed non-profit 501 (C) (3) charitable organization, as the successor organization to the Food Pantry at St. Bridget. We also have a new pantry located at 175 Sandbank Rd, Cheshire, CT 06410. The Cheshire Community Food Pantry Inc. is non-denominational faith-based organization that is overseen by a Board of Directors. This all volunteer group includes several members from the local business community, and three partner members, one representing the faith based community in Cheshire, one representing the Town of Cheshire Youth and Social Services Department and one member representing The Cheshire Food Drive, Inc.
Daily pantry business is carried on by seventy five volunteers and managed by Executive Director and Pantry Manager who are appointed by the Board of Directors. Together they work side by side to help their neighbors in need.